Where else can you find a 3-level 10 year old home over 5000 SF in Myers Park? 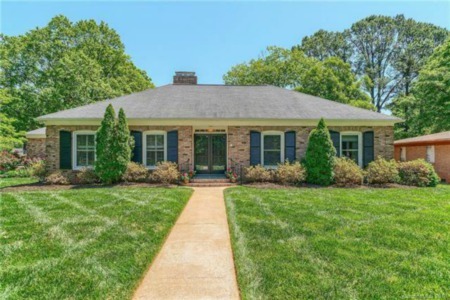 Beautiful, large brick home with open floor plan, tall ceilings and doors, custom everything! Bright & sunny, walks out through double doors onto large deck perfect for entertaining. Front room full of windows is great formal dining, large office, or music room! True gourmet kitchen with 48" gas range, 2 sinks, Ceasarstone counters, very large walk in pantry. Hansgrohe fixtures throughout, 18" travertine tile in baths. Spacious living room with fireplace and built-ins. Very large Bedrooms on 2nd floor: amazing Master suite, Jack & Jill and 4th BR with access to large bath and laundry. Huge basement with 5th Bedroom and full bath, office with bookshelves and large bonus/rec room. Walks out to screened porch and large fenced backyard, great for pets and so private! Anywhere else in neighborhood you'd pay hundreds of thousands more-this one is truly worth the look! Directions:Park Rd. to Selwyn, 2nd home on left. Park in driveway or on street across the road from house. Listing provided courtesy of Homes with Cachet LLC. SchoolsClick map icons below to view information for schools near 3928 Selwyn Ave Charlotte, NC 28209. Home for sale at 3928 Selwyn Ave Charlotte, NC 28209. Description: The home at 3928 Selwyn Ave Charlotte, NC 28209 with the MLS Number 3470190 is currently listed at $700,000 and has been on the Charlotte market for 80 days. You are viewing the MLS property details of the home for sale at 3928 Selwyn Ave Charlotte, NC 28209, which is located in the Myers Park subdivision, includes 5 bedrooms and 5 bathrooms, and has approximately 5161 sq.ft. of living area.